Ekta’s mural has made it to the World Atlas of Street Art and Graffiti, published by Yale University in 2013. 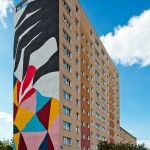 One of a few 36-metre murals in Zaspa to be completed without the help of assistants. It shows Narcissus, so much in love with himself that he needs no contact with the outside world. In the desire to fulfil his love, Narcissus cuts off a piece of his own flesh so that he can taste himself.